"I know I'm supposed to eat five servings of fruits and vegetables every day. 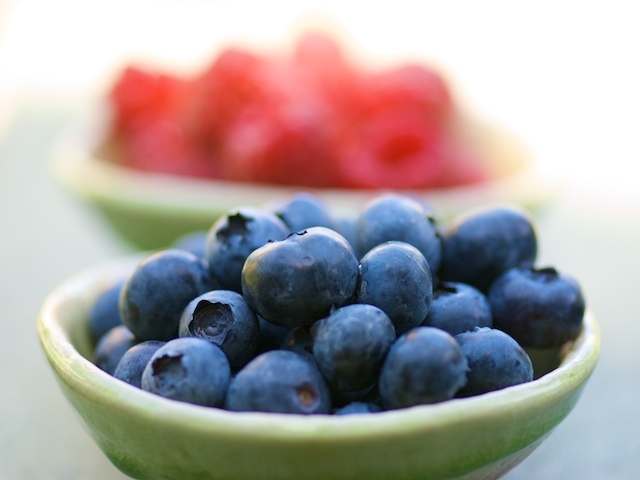 Which are the best summertime fruits and vegetables to eat?" You can't go wrong with vegetables, but certain fruits and vegetables just scream summertime: Fresh corn on the cob. Colorful heirloom tomatoes. Juicy, drip-down-your-chin peaches. Crunchy Kirby cucumbers. Hot weather calls for light fare, and if you’re looking for a simple way to get your recommended five servings a day of fruits and vegetables, boost overall health, and possibly drop a few pounds in the process, head to your local farmers' market, roadside stand, or neighborhood grocery store to stock up on summer produce. Many studies have confirmed that a diet rich in fruits and vegetables helps reduce the risk of chronic illnesses, such as high blood pressure, stroke, high cholesterol, cardiovascular disease, macular degeneration, diabetes, brain aging, cancer, and obesity. But how much produce do we actually eat? Unfortunately, not much. A recent study in Nutrition Journal reported that we Americans over-exaggerate how much we eat because of social-approval bias: We know we’re supposed to be sticking to five servings a day, but we often bend the truth to make ourselves feel better. To find a farmers' market near you, check out the new Culinate [/mix "farmers’ market community pages"]. And learn how to shop the market without breaking the bank by reading Matthew Card's article "[articles/features/shoppingonabudgetatfarmers_markets "Market inspiration"]." Thankfully, easy access to great summer fruits and vegetables makes it easier to get them into your diet. There’s been a lot of talk in recent years about eating locally grown foods. There are [/articles/features/Going+local "many reasons for this"] — everything from supporting local agriculture to using less fuel for transporting goods. From a nutritional standpoint, in-season, locally grown produce makes a lot of sense: It packs more nutrients than what you’ll find year-round in grocery stores. Produce grown close to home is harvested when ripe or just beforehand, so vitamins, minerals, and antioxidants are at their peak. Here’s a quick rundown of the season's best produce. Why they’re so good: Just two of these little fruits boast nearly 50 percent of your daily vitamin A (great for vision) and are high in vitamin C. Their stash of beta-carotene and the antioxidant lycopene help ward off disease risk and may lower LDL cholesterol. And two apricots are just 35 calories. How to pick: Look for apricots that are a rich, golden orange rather than a pale yellow. How to eat: Grill them and pair with chicken or pork, toss them into cereal, or eat them fresh. Why it’s so good: Bring on the folate and vitamin K! Just 1 cup of diced asparagus spears (about four spears) has 115 percent of your daily recommended intake for vitamin K and 65 percent for folate. Folate-rich foods play an important role in cardiovascular health and preventing birth defects. Asparagus is also high in vitamins A and C.
How to pick: Both thick and thin spears are fine. Keep asparagus in the fridge to ensure freshness and nutrient quality; break off woody bottoms before preparing. Spears should be crisp and have a natural breaking point. If spears are thick, peel them for a more vibrant shade of green and quicker cooking time. Thin spears require no peeling. How to eat: Steam, parboil, roast, sauté, or grill. Serve with vinaigrette or a simple squeeze of fresh lemon juice, toss into a salad, pasta dish, or stir-fry, or nibble plain. [%image raspberries float=right width=350 caption="Raspberries are loaded with antioxidants."] Why they’re so good: Berries and cherries are antioxidant powerhouses fending off cancer, heart disease, and the aging process. They’re also loaded with fiber and vitamin C. Blueberries, raspberries, and cherries contain anthocyanins, antioxidants that give them their red and red-blue hues. How to pick: Look for rich, bright colors and a firm plumpness; softness means they're overripe. How to eat: However you wish! Pop them plain for a quick sweet snack, toss into cereal or yogurt at breakfast, liven up a salad or side dish, or bake into a summery fruit crisp or crumble. 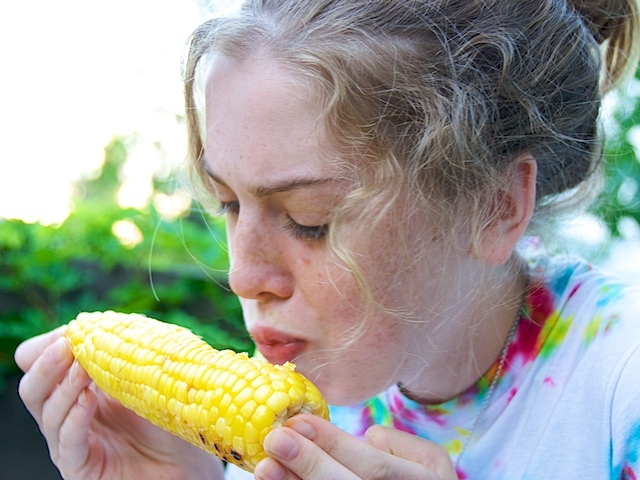 Why it's so good: Summer just isn't the same without a fresh ear of sweet corn rounding out your plate. 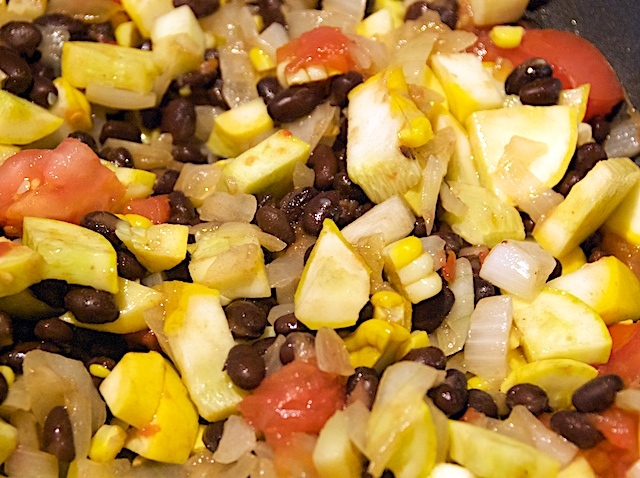 Often shunned as a "starchier carb," corn actually has a lot of health to offer. [%image corn float=left width=350 caption="Corn on the cob is an American favorite."] A single serving provides nearly 20 percent of your daily recommended intake of vitamin B1 (also known as thiamine), which plays a role in your body's energy production and memory function. Corn's also a good source of folate and fiber. How to pick: When picking an ear, look for a fresh husk and pull it back just a bit to check that the kernels haven't gone bad or browned. Kernels should be yellow or white. Store in a cool place or refrigerate. How to eat: Steamed right off the cob; grilled with a smidge of cotija cheese and fresh lime; or boiled and cut off the cob into salads and salsas. Why they're so good: "Cool as a cucumber" is certainly an appropriate phrase for this crunchy, refreshing veggie. Cucumbers have a high water content, so they cool us down when the weather heats up. They also contain vitamin C.
How to pick: Tasty, crunchy cukes should be firm to the touch — no bumps or bruises — and kept refrigerated. How to eat: Sliced raw; paired with tomatoes, feta, and red onion for a summery side dish; diced into salads, salsas, and gazpacho; or pickled with vinegar and white onions. Why they’re so good: Peaches are loaded with vitamins A and C as well as fiber and potassium. Rich in antioxidant plant compounds called flavonoids, peaches also assist in disease prevention. They’ve got a high water content (87 percent) and, at 38 calories a pop, they’re a satisfying, low-calorie snack. How to pick: Ripe peaches are slightly soft to the touch. Take a quick sniff; if a peach is particularly fragrant, it’s generally a great indicator of major flavor. How to eat: Drizzled with balsamic vinegar and paired with arugula and Parmesan or feta cheese in a light summery salad; grilled and served with roasted or grilled chicken; tossed into whole-grain cereal, muffins, or plain yogurt; atop low-fat ice cream or as the main feature of peach pie; or on their own, plain and simple. [%image squash float=right width=350 caption="A melange of summer vegetables contains squash at its center."] Why it’s so good: Summer squash (zucchini, yellow squash, patty pan, crookneck, and other local varieties) is a good source of vitamin C, A, fiber, and potassium. The antioxidants in vitamin C and the beta-carotene in vitamin A help decrease inflammation and lower the risk of heart disease and cancer. How to pick: Squash should be firm to the touch. Store in the refrigerator or a plastic bag for up to a week. How to eat: Cut up raw with hummus, guacamole, or a yogurt dip as a snack; shaved into ribbons (using a mandoline) for a refreshing side dish with fresh mint, walnuts, ricotta salata, lemon, and olive oil; grilled, sautéed, or steamed; tossed into pasta sauces and salads; or added to your favorite bread, pancake, or muffin recipe for a healthy twist. Why they're so good: This summer fruit is widely known for its health benefits. In peak season (July through September), tomatoes are rich in vitamins A, K, and C (just 1 cup contains over 55 percent of your daily recommendation for vitamin C). Tomatoes are also jam-packed with lycopene, an antioxidant pigment that gives tomatoes their red coloring and appears to play a significant role in lowering the risk of certain cancers like prostate and breast. Cook 'em up to release the lycopene, which is easier for us to absorb when tomatoes are cooked or canned. How to pick: The more vibrant the color, the more lycopene content and often the greater the flavor. Sweet-smelling ripe tomatoes should give just a little when pressed and shouldn’t be bumped or bruised. How to eat: Sliced or diced; paired with fresh basil and buffalo mozzarella as a tasty appetizer; tossed into salads and pastas; incorporated into sauces; and roasted or grilled as a side dish, topping, spread, or salsa. Test out our Fresh Tomato and Basil Summer Pasta Salad. 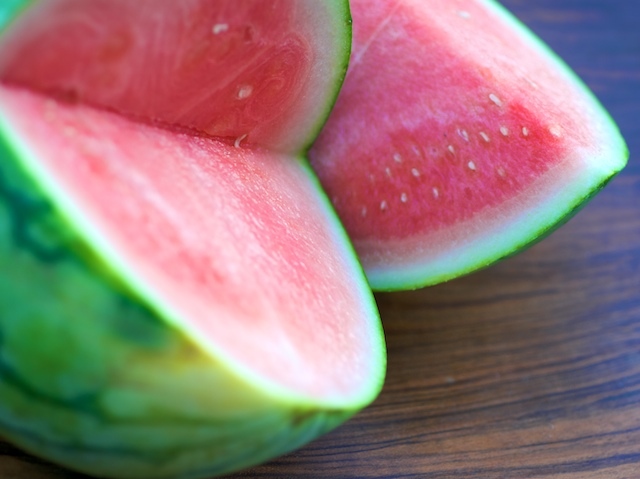 Why it’s so good: Closely associated with summertime eats, watermelon is incredibly refreshing and thirst-quenching thanks to its high water content. It’s also rich in lycopene and vitamins A and C.
[%image reference-image float=left width=350 caption="Watermelon is refreshing … and loaded with lycopene."] How to pick: For maximum juiciness and taste, scout out a watermelon that’s fairly heavy and has a smooth rind. The flesh should be bright pink-red (or bright yellow if you’re checking out a yellow watermelon). If your melon’s seeded, the seeds should be dark. How to eat: Straight up! Also tossed into salads like our Watermelon Feta Salad with Fresh Mint or into side dishes and salsas; grilled and served with seafood or chicken; or blended into drinks and coolers.